I was with a group of business people recently when one of them brought up the problem of calculating the volume that remains when a circular cylinder is removed from the center of a sphere. Since the remaining figure resembles a napkin ring, this is sometimes called the Napkin Ring Problem. The surprising fact is that the volume does not depend upon the radius, r, of the sphere, but only on the height of the cylinder. Vol of ring = vol of sphere - vol of cylinder - 2 x vol of end cap. The entire computation is given here. 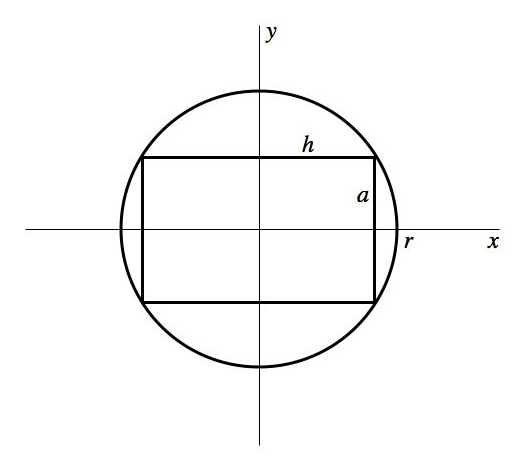 In the extreme case where the cylinder has height 2r, where r is the radius of the sphere, the cylinder has zero diameter, of course, so no volume is removed from the sphere, and in this case the volume formula reduces to 4/3 PI r^3, the standard formula for the volume of a sphere. As the only mathematician present, I was asked to explain how this answer is obtained. We were, however, in a restaurant at dinner, and with the main course about to be served, I was reluctant to start scribbling on napkins (for which rings were not provided, as it happens). Instead, I remarked that this was a well known problem in calculus courses, and that they would have no trouble finding the answer on the Web. Search on "napkin ring problem" or else the search terms "volume + sphere + cylinder + removed" I said. This answer has two terrible errors: first, assuming the cylinder has the same radius as the sphere and second, forgetting to account for the two end caps. My experience emphasized yet again that anyone who uses the Web to find information should exercise caution. Just because something it stated in a professional looking web page, doesn't mean it is necessarily correct. Students please take note. Finally, in last month's column I reproduced in its entirety an essay on K-12 mathematics education by a New York based math teacher (with a Ph.D.) called Paul Lockhart. The publication of Lockhart's essay generated a large volume of email for me, and apparently a much larger flood for Paul himself. The emails I received ranged from the passionately negative (one writer started his tirade with the words "the guy borders on being a complete whack-job") to the highly enthusiastic. The latter were by far the majority. There were also a number of emails that, while generally in support of the points Lockhart was making, sought to temper or counter particular aspects of his argument, for various reasons. Many of the points raised were related to the fact that, in addition to mathematics' intrinsic beauty as an intellectual pursuit, it is a darned useful tool that many professionals need to have mastery of, but have little interest in, or time to focus on, the subject itself. This connects to the "American Mathematics in a Flat World" issues I raised in my January and February columns. I'll provide a summary of the feedback I received in a later column.